If you have ever been overzealous at the start of barbecue season, you may have encountered a surplus of leftover grilled meats. Fortunately, you don't have to let those extra grilled chicken pieces go to waste if you freeze them quickly. 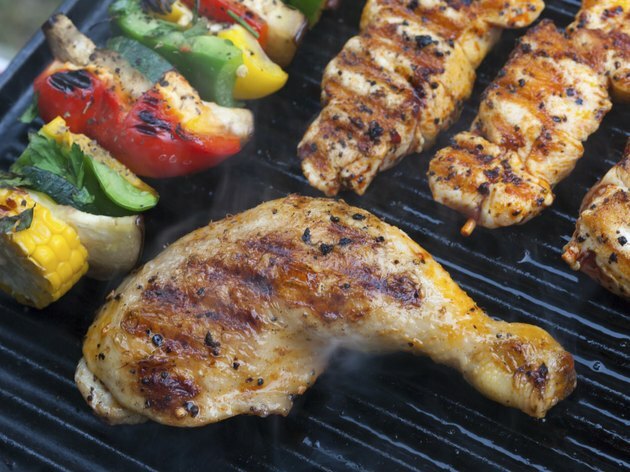 Frozen, grilled chicken will help you save time on busy nights. Defrost the chicken the night before and use in salads, stir-fries or serve with vegetables and a baked potato for a quick and healthy meal. Refrigerate the chicken immediately after cooking. Decreasing the internal temperature of the chicken rapidly will help to keep the risk of contamination at bay. The longer meat sits out at room temperature the greater the risk of foodborne illness. Place the chicken breast pieces in a freezer bag and squeeze out as much air as possible. Label the bag with the date it was frozen and put in the freezer. It will keep for up to three months before your should discard it. Defrost in the refrigerator overnight before consuming. Do not ever thaw and refreeze meat.